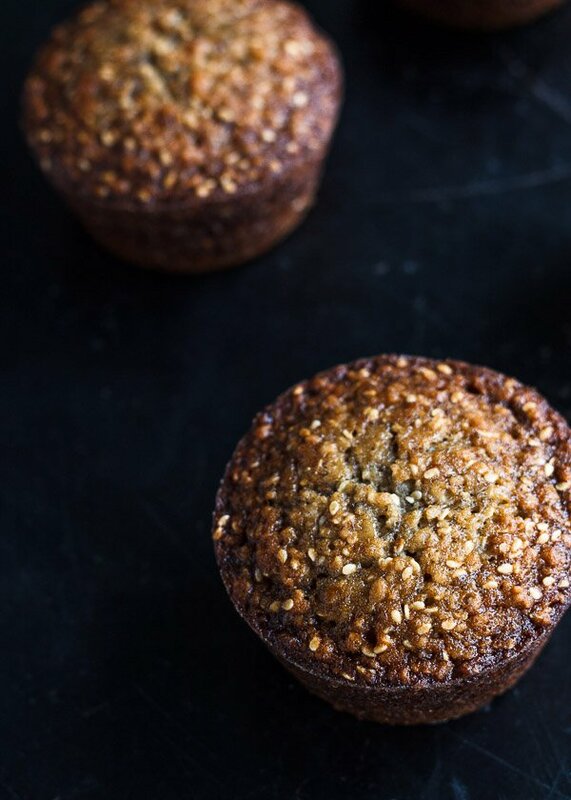 For my dad, who is a muffin king – tender, whole grain breakfast muffins big on banana flavor and light on the sugar. 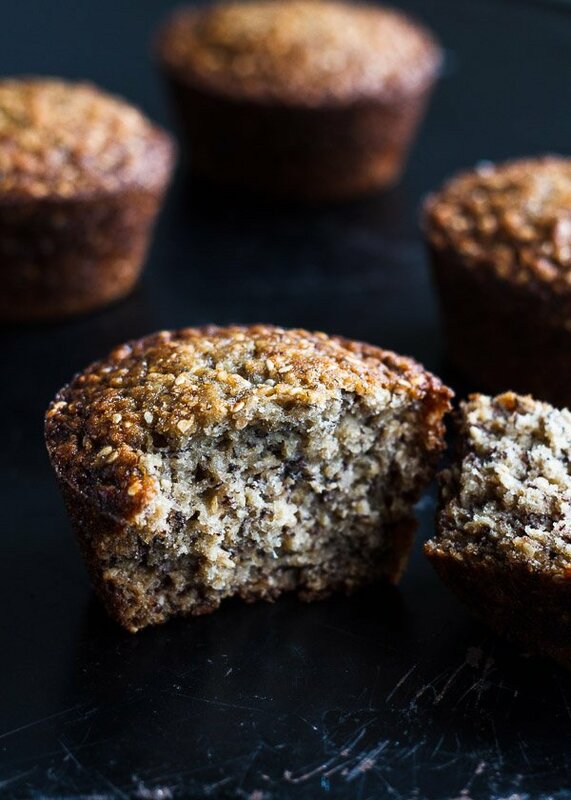 Toasted sesame seeds add a nutty crunch to this new year’s resolution friendly banana bread muffin. Happy merry 2015! This is going to be the year of the Viking diet. I read in Vogue that we’re going to start eating more berries, foraged foods, seaweed, fish, moose (no thanks), and whole grains (okay, can do!) this year. Actually, I guess I already eat like a Viking, cake aside. It’s not always reflected on here, but I’m going to be better about that. I counted 10 types of whole grains in my cupboards yesterday, so no excuses. In 2014, I was a bit timid. I didn’t post a lot of my own original recipes because I decided they weren’t sugary enough for America or they were too green. Well, screw that. We could all use a little less buttercream and a little more porridge. But first, I reinvented banana bread. It isn’t 100% virtuous, but it’s virtuous enough for breakfast. There’s still sugar and all-purpose flour, but far less than standard recipes – possibly half. In spite of that, I actually think the flavor is better. 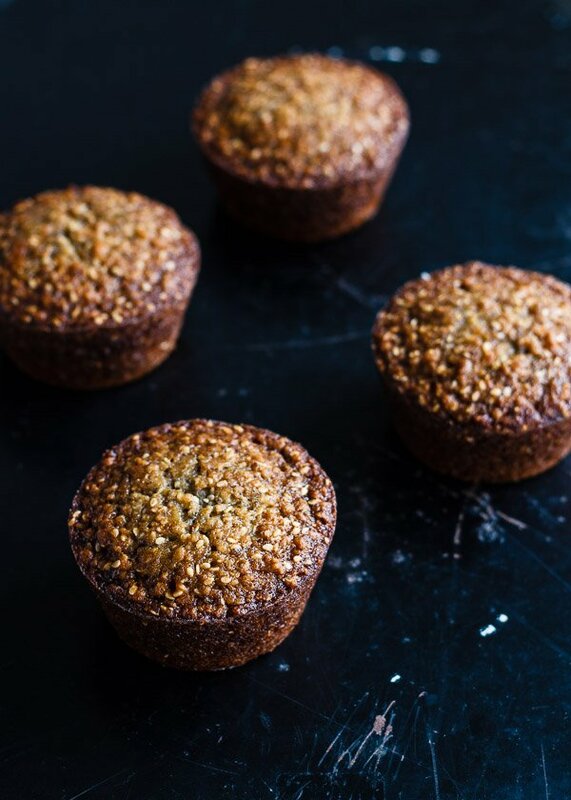 The bananas (there’s at least half a banana in each muffin) really shine now that they aren’t drowned out by the sugar, and whole-grain oats dominate flour by ratio. I left the standard stick of butter alone, because I don’t think there’s anything wrong with fat, especially if you buy good quality organic butter. Toasted sesame seeds are not only tasty but high in copper, calcium, and cholesterol lowering fiber. Most importantly, they make my hair shiny. I tested recipes for banana bread something like ten times in 2014. So many recipes unimpressed me. Too bland, too sweet, or too sticky. Finally, one day I just dumped a bunch of oats, banana, butter, and honey in a blender without measuring and called that banana bread. A last ditch effort, if you will. Toast your own sesame seeds in a flat pan over medium-low heat for about 5 minutes. Stir constantly, shaking the pan occasionally, until the sesame seeds begin to brown a little and become fragrant. Let cool before adding it to the banana bread mix. 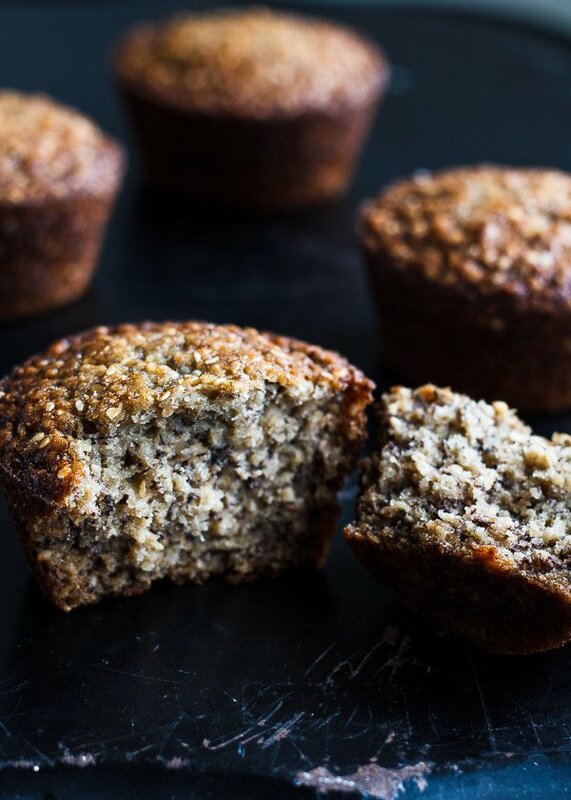 Brush a 6 cup muffin pan with melted butter. 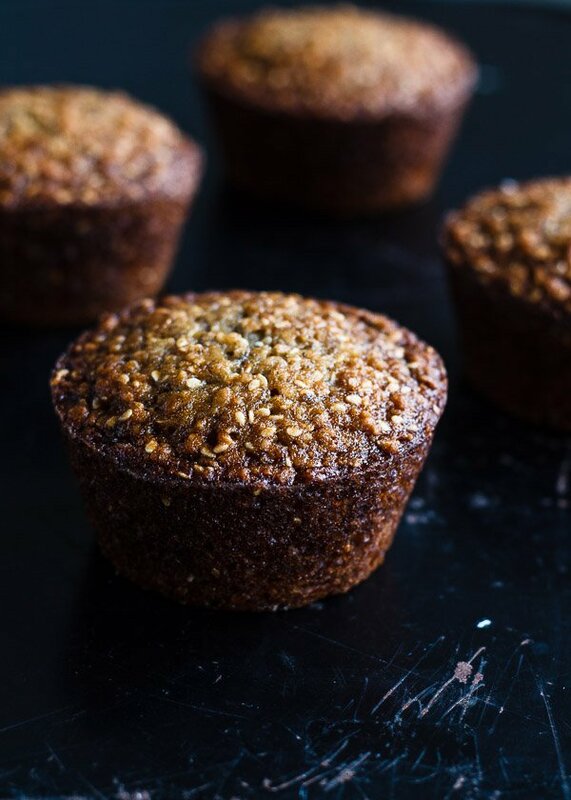 Dust each muffin cup with flour, then flip over a sink to shake out excess flour. Combine the rest of the butter with mashed banana, sugar, and vanilla extract. Mix until completely smooth, then beat in the eggs. Whisk the oats, flour, baking soda, salt, cinnamon, and toasted sesame seeds in a separate bowl. Add the dry mix to the wet mix in thirds, stirring and folding the batter until fully incorporated. Do not overmix. Fill the muffin cups with batter until roughly 3/4 full. Bake for 20-25 minutes, rotating halfway through. I baked mine for 25 minutes because I like them a little extra browned. Adapted from all the banana bread recipes out there, including Joanne Chang's and my mom's, but in the end, this was born out of dumping ingredients into a blender without measuring, so I hope that makes this recipe mine! Thanks Sara! The sesame seeds won’t burn because they’re mixed into the batter. And I’m so glad you agree that less sugar tastes better 🙂 Hope you like these! These look delicious! I love the addition of sesame seeds. And yeah, I’m definitely with you on the moose – no thank you! hahaha right?? and no ants either! Lu, these are so beautiful! Look so wholesome and delicious. Love the addition of oats and sesame! These look so amazingly yummy!! Craving one right now! Thanks Frankie! I’m inspired by all the healthy eating blogs like yours! 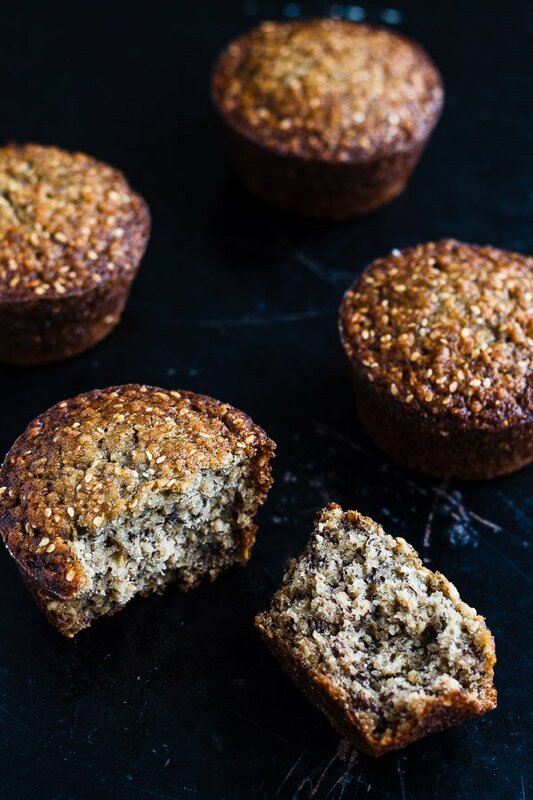 I can never go past a good homebaked muffin.. totally craving one of these to devour right now, they look so moist, delicious and surprisingly healthy! Love this so much! Especially how banana-y they are and that you left in that stick of butter 🙂 And the sesame seeds. 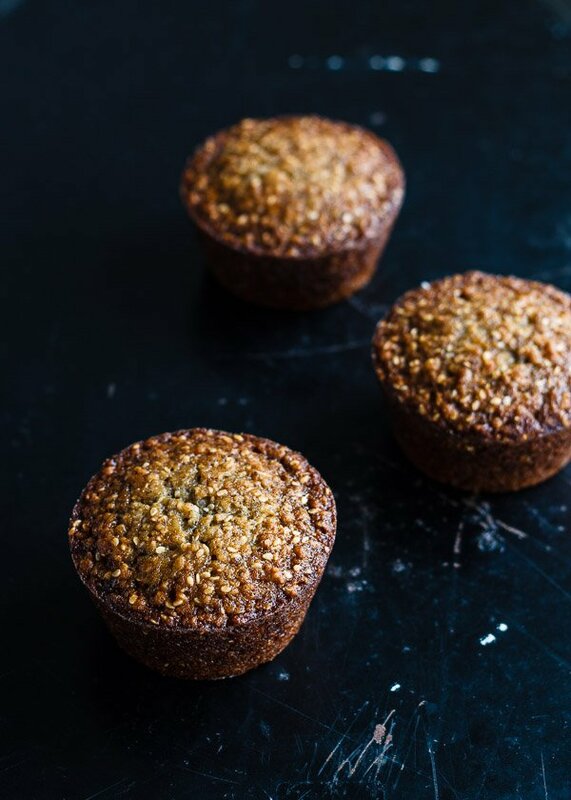 I’ve had good turn results with coconut sugar in muffins before, will try this recipe subbing that for the regular sugar and let you know if it turns out!